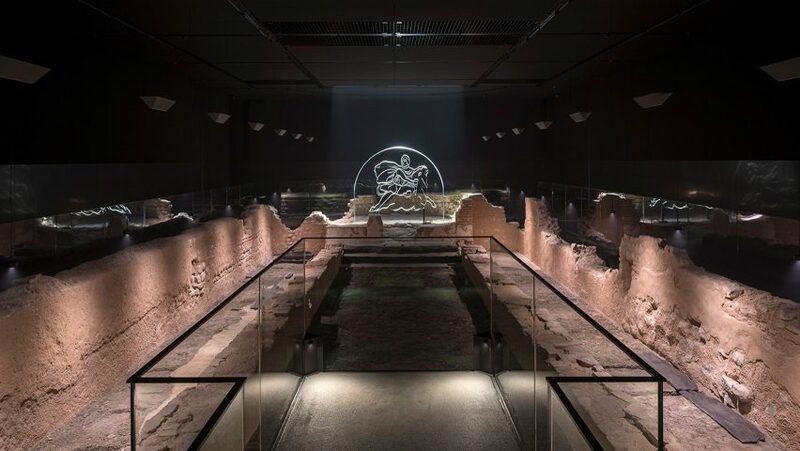 A subterranean Roman temple where a mysterious cult worshipped has been restored within an immersive museum below Bloomberg's headquarters in London by 9/11 memorial museum exhibition designers Local Projects. Part of Bloomberg's £1 billion Norman Foster-designed European headquarters was restoring the Temple of Mithras to its original location seven metres below modern street level. The reconstructed temple sits in a dark room with a viewing gallery running around the sides and a platform suspended over the nave. The free museum was masterminded by Local Projects, the US experience design studio that worked on the National September 11 Memorial Museum in New York, which specialises in "emotional storytelling." "This is very self consciously meant to be a beautiful and minimalist experience," Local Projects founder Jake Barton told Dezeen. "The reconstruction with the light walls is very austere, the mezzanine area is quite restrained." Visitors to the London Mithraeum enter through the Bloomberg Space, a new art gallery on Walbrook Street with a rotating display of contemporary art. Here there is a vitrine displaying 600 of the artefacts discovered in the 2010-14 archeological dig undertaken ahead of the construction of the Bloomberg building. The wet soil of the Walbrock valley means the 14,000 objects unearthed were unusually well preserved. One particularly outstanding find was the earliest dated writing tablet from London. Written 8 January AD 57, it is a financial record of money owed, dating from when London was just 7 years old and 1,960 years before a global financial markets company built their base on the site. From here, visitors descend to a dimly lit mezzanine level, with smokey scenes of Roman statues projected against the walls and interactive screens on plinths containing all the information gleaned about the temple by the Museum of London Archaeology (MOLA). Once visitors move down another flight of stairs into the temple itself there is no written information, just the sensory experience of the ruins emerging from the smoke-filled atmosphere. "That's very much on purpose in order to invite visitors to supply their own imagination and their own thoughts," explained Barton. "We wanted people to feel they had a personal, direct, and individual experience." In between each cycle the haze is sucked back out of the space to reset, an airflow management process that was tricky to execute underground. "There were huge challenges around taking a light and haze installation, which tends to be impermanent, and turning it into a permanent structure experience along with ancient ruins," said Barton. Local Projects tested its design to multiple stages of prototyping, including building a scale replica of the exhibit in a warehouse in Battersea. The result is one that Barton, and Bloomberg founder Michael Bloomberg himself, hopes visitors will find "spectacular". "Being able to stand inside of that Mithraeum, with the walls being created around you, listening to the ritual, gets people activated and engaged because they're somehow projecting themselves into the space and projecting themselves into that time," said Barton. The temple was originally discovered in 1954. Bombing during the Blitz in the second world war had destroyed most of the buildings on the Victoria Street site, and after the war excavations of the rubble revealed the 1,800 year old temple. Little is known about the Cult of Mithras as it was so secretive at the time. It's all-male membership was drawn from soldiers, merchants and freeman who travelled widely through the Roman Empire. It is believed members gathered in windowless temples to drink and perform rituals and animal sacrifices naked in the dark, illuminated by torchlight. The mythology of Mithras involves the young deity killing a primordial bull in a cave, and every temple dedicated to him would have prominently displayed a bas relief called a tauroctony depicting this moment. Academics have hypothesised this was a form of creation myth that drew on theories of the cosmos. In 1962 the London temple remains were removed wholesale and reassembled nearby above a carpark, completed with somewhat anachronistic elements including a crazy paving floor. The Bloomberg-funded return of the temple to its original spot attempted to be more faithful to the original settings. Even the earthen floor of the restored ruin is a hand-painted resin cast of a reconstruction of trampled Roman-era soil. Above the museum rises Foster + Partner's sandstone and bronze office building for the media organisation Bloomberg, which has been called the world's most sustainable office building.